While working in storage this summer, I became curious about the kinds of artist representation present in the Museum’s collection. One artist in particular stuck out to me: Ruth Duckworth, whose works make up a significant portion of the sculpture and decorative arts collection. The breadth and diversity of her work in the Smart’s collection is incredible, spanning everything from sculptures and architectural elements to beautiful and delicate dishware. While her work takes on an array of forms, almost all made from ceramic, her material of choice. Her style is also quite unique, a marriage of modern techniques with archaic, almost primitive imagery reminiscent of Bronze Age forms. Since her work encompasses such a variety of shapes and sizes and plays such a prominent role in the collection, I was eager to learn more about her and how her works had come to be here. While it is often easy to overlook the artist in favor of the work itself, I was determined to understand how Duckworth’s experiences had led her to develop such a fascinating style and brought her works to their current locations. She was an incredible visual artist with an inspiring story of perseverance in the face of adversity. From the very start, Duckworth’s life was a fight for survival. Born in 1919 to a Jewish father in Hamburg, Germany, she grew up amid the rise of Nazism. She was forced to leave her home in 1936, as restrictions put in place by Nazis made it impossible for her to attend school in Germany. Instead, she moved to London where she went to art school and studied sculpture. She remained there during WWII and worked as a tombstone carver, a nod to the tumultuous times she lived in. After the war, Duckworth continued to explore sculpture and adopted ceramic as her primary medium. She pioneered new forms and techniques with the material, rejecting traditional wheel-thrown ceramics in favor of large-scale porcelain sculptures. It was one of the first times that this material had been used on such a vast scale. She approached her craft like a battle, stating that ceramic is “a very temperamental material. I'm constantly fighting it. It wants to lie down, you want it to stand up. I have to make it do what it doesn't want to do. But there's no other material that so effectively communicates both fragility and strength." In 1964, Duckworth joined the faculty of the University of Chicago and taught visual arts classes for the Visual Arts Department at Midway Studios. Her first major commission was also here at the University, where she produced the mural Earth, Water, Sky for the Henry Hinds Laboratory for Geophysical Sciences in 1968. This work, now celebrating its 50th year, has become a permanent fixture on campus, representing the institution’s commitment both to education and to art. It was also an incredibly important work for Duckworth, bringing her several more large-scale commissions and international fame as a renowned, pioneering visual artist. Her work as a teacher and artist on campus also helped to encourage students, staff and faculty alike to consider the University as more than just an intellectual environment, but an artistic one too. This would be further solidified by the creation of the Smart Gallery a few years later, now the Smart Museum of Art. The Smart Museum likewise possesses a number of Duckworth’s works. While none are on quite the same scale as the mural in the Geophysical Sciences Building, the Smart’s collection helps illustrate the various forms and techniques employed and explored by Duckworth throughout her career. Works include everything from small plate-like vessels, bowls, and ceramic wall panels. The Smart also owns the maquette for Earth, Water, Sky, her preliminary model for the larger work on campus. At only 2’ x 2’ x 2’, this miniature shows Duckworth’s process in creating this work, translating her small-scale ceramic art into her very first large-scale mural. Likewise, this this sculpture illustrates the important exchange between the academic and the artistic which took place on campus, and continues to this day. The presence of this work at the Smart speaks to the broader relationship between the museum and the University, institutions which work together to promote the arts and artistic education. Ruth Duckworth’s story in an amazing one. Living to the age of one hundred, she experienced war, upheaval and religious persecution. 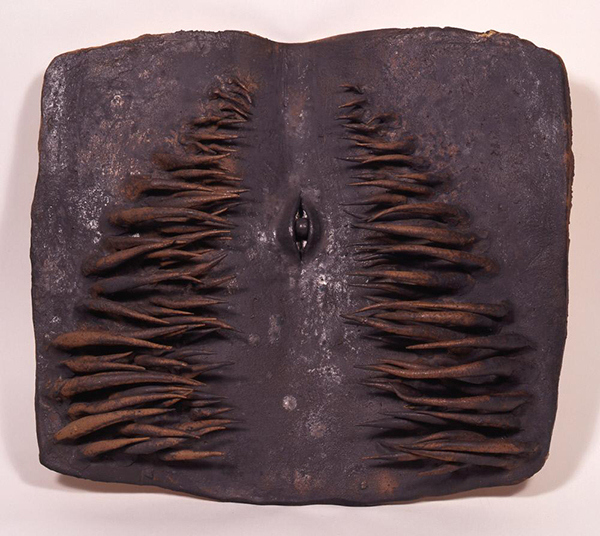 However, she channeled her experiences into her artwork, shaping the future of sculptural art not only through her influence as an artist, but as an educator as well. Working at the University of Chicago, she inspired generations of young artists with her classes as well as students who experienced her artwork around campus and the city of Chicago. Her works at the Smart Museum remain available to students and the public who are interested in exploring her legacy and understanding her journey her at the University of Chicago. In all, Ruth Duckworth was an individual who persisted in the face of adversity, facilitated crossover between the academic and the artistic, and created a place for herself both at the University of Chicago and within the Smart Museum of Art. This is the second in the Secrets of Storage series, where Emelia shares findings uncovered during her collections internship. The first post touched on her research into an unexpected element of Chicago’s architectural history and the second one on Alexander Calder’s tapestries. Ruth Duckworth, Untitled, 1972, Glazed stoneware. Smart Museum of Art, The University of Chicago, Gift of Margaret Fisher, 1967.24. 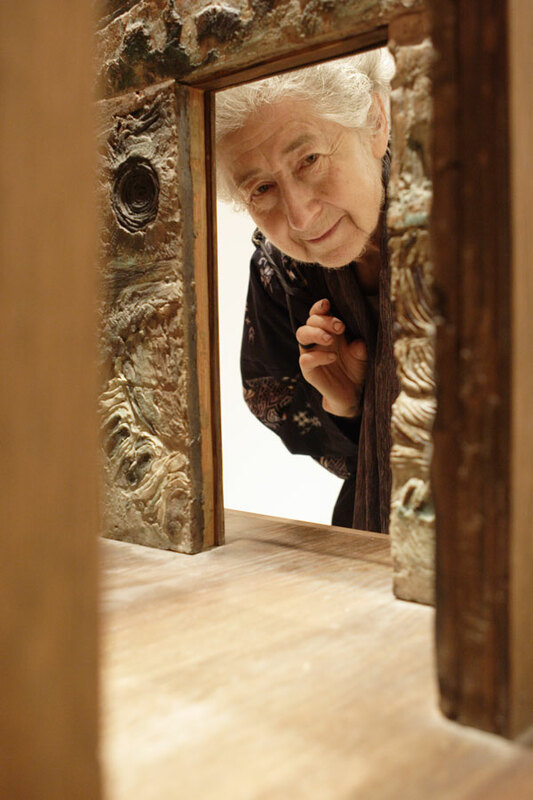 Ruth Duckworth looking through the maquette for Earth, Water, Sky in 2005. Photo by Jim Newberry.